Years ago, I expressed my views supporting marriage equality. My pastor at the time was not supportive of my perspective. “I could help you change your mind,” he said to me. I prayed. I read Scripture. I listened and read stories of the ever expanding love of God in gay and lesbian relationships. And then I realized I couldn’t go back. I couldn’t minimize my view of love. Or family. Or marriage. There were no holy scissors big enough to eliminate the love which abides in lesbian and gay relationships. I then chose to become a member of a United Church of Christ congregation. It was a small congregation where everyone knew one another’s name. When I joined, they hadn’t yet officially taken a vote to become Open and Affirming, but while I was a member, we voted in the affirmative. The denomination had voted to affirm marriage equality in 2005. I currently serve a congregation that is not Open and Affirming. Without their approval, I will not perform a same-gender ceremony in the church’s sanctuary. However, I will perform a same-gender wedding ceremony anywhere else. Now that marriage is legal for heterosexual as well as lesbian and gay relationships all over our country, I feel it is in my theology of justice and equality that I offer this blessing to all people. In fact, I’ve already done one. In November 2014, I presided over the wedding and was blessed to sign a marriage certificate in Illinois for a wonderful couple, Debbie and Jessica. I’ve known Debbie since elementary school, and I was honored to be asked to preside over their wedding. My entire immediate family was on hand to watch me officiate the wedding for these two wonderful women. Through Debbie and Jessica, just like the other couples whose weddings I’ve also officiated, I see how God is the God of expanding and just-filled love. 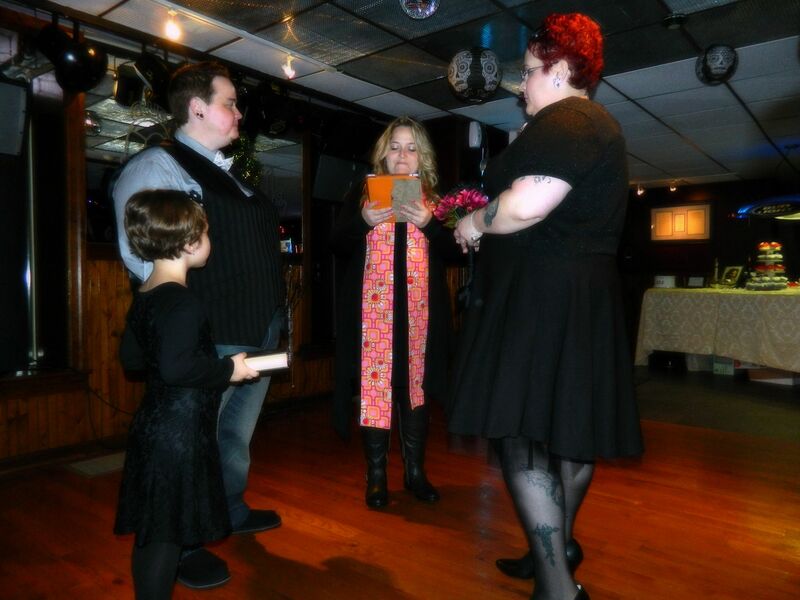 Photo of me presiding over Debbie and Jessica’s wedding in November 2014. They’re able to be their most truest selves – loving honestly, living authentically. Isn’t that what God would want for each of us? Marriage equality isn’t only a justice issue but also a pastoral issue. When two people want to combine their lives together and form a covenant with one another in the presence of God and all of creation, the pastoral need calls for us pastors to tend to those whose hearts need care. There will be many who believe that the Bible abhors same-gender relationships. Yet relationships during the time when the Bible was written were ones where the men had most of the power, women were secondary human beings, and marriages were not exactly consensual for both parties. I look at Michal, Saul’s daughter whom David won as a war prize. Even after he deserted her and she was given in marriage to another man, David reclaimed Michal as property. Most likely, Bathsheba didn’t have a choice except to marry David after he impregnated her (probably without her consent). Both Leah and Rachel had to be “earned” by Jacob. Vashti was banished because she wouldn’t provocatively dance for her husband and his friends. From these examples we see that mutuality in today’s heterosexual relationships is much different than what we read in Scriptures. Relationships have changed greatly even since mid-nineteenth or twentieth century Western Civilization. This can only lead us to the conclusion that relationships continue to evolve and will continue to transform. As long as two people can make the covenant they desire and both can agree upon, and both people can demonstrate respect for one another, then we, as church leaders, should support their love wherever it stands. And maybe that’s the way God wants it to be. From couples of all genders and colors and economic groups and religions and everything else, I continue to see a Divine love that’s always expanding. I often wonder how relationships will look in fifty years. Yet if God is the God of constant motion and the architect of love, then God will lead us to welcome love in all forms – even if it’s unfamiliar. How will we open ourselves to new forms of family, relationships, and love? How can we embrace what is said in Scriptures but also listen to the still-speaking God in our midst? The following are other bloggers writing on this topic for the July Synchroblog. Many of these writers provide views very different than mine. In a spirit of love and dialogue as covenantal members of the Body of Christ, I still encourage you to read each of these. May God’s love transcend the differences we hold. Amen. 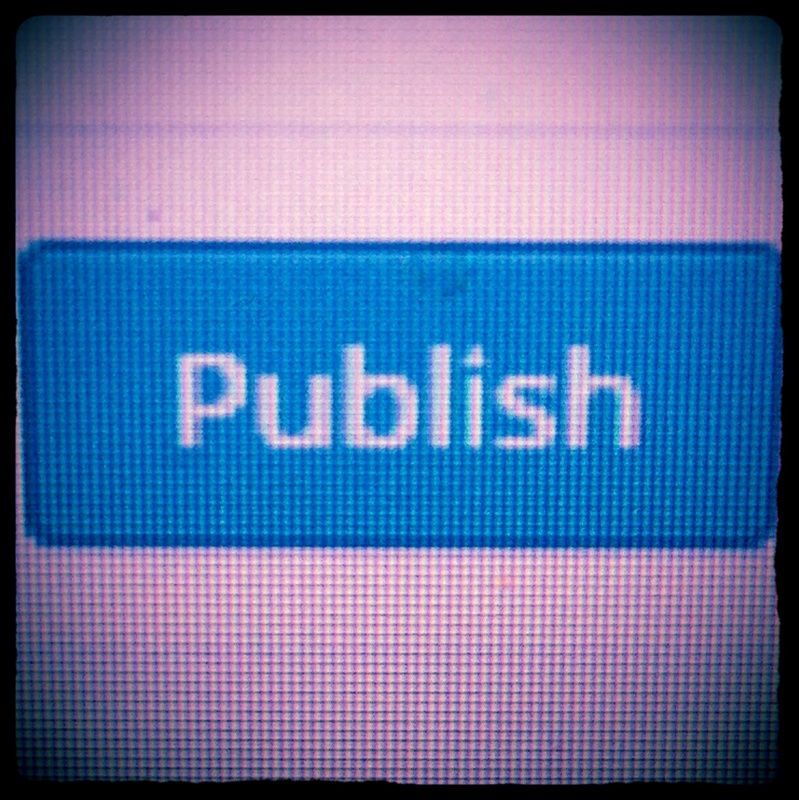 As a perfectionist, there is nothing more difficult and terrifying as clicking the submit/publish/send button. What if I wrote didn’t make sense? What if they don’t like it? What if I made a mistake and can’t correct it? Each day we send e-mails and wonder how responses will be after we click “send.” When we haven’t heard back in a while, we wonder what must be happening. When we publish a post we double check if there’s a terrible error or humiliating typo – even after publishing – because… well, we’re perfectionists. After checking over important e-mails, posts, and documents over and over again, we finally click submit. We must click submit or life would be unfulfilled and our work would never be complete. God’s call would never have been answered. We would be living in purgatory – knowing that life can’t go forward without clicking submit. Our seminary papers and book proposals and e-mails about future happenings and blog posts would never happen if we didn’t eventually click submit. So we jump into the cold water of the unknown, waiting for greatness or failure or some life-changing event to take place. We wade in this frigid lake until some response happens, whether it is negative or positive. And we hope that the Holy Spirit will take our words and shine whatever light is needed upon them and hope that positivity will endure. We turn our filled minds to you. We must let this go. Allow us to release our work into the world. And may we sleep well until we hear the responses from our labors. And we live into your call. Amen. This is a post I originally wrote for the RevGalBlogPals blog feature “The Pastoral is Political”. Recently, we’ve seen how fellow clergy in Charleston, South Carolina have been gunned down within their sanctuary during a standard Bible study. Only days after this horrendous crime, news stories report black churches being torched and 20 women clergy in the African Methodist Episcopal congregations receiving letters threatening their lives and the well-being of their families. I’ll be honest – if I was them, I’d be running far away from my church, changing my name, and hiding under my bed. I suppose I’m much like Peter on the day of the crucifixion – ready to cling on to the known of this life rather than stand in the openness of peril that can come with being a pastor. I don’t necessarily know how we forget this reality. Jesus himself found that doing justice and showing kindness led him to capital punishment. Most of his closest followers during the first century CE met the end of their life while practicing extravagant love and grace. In the 1940’s, Dietrich Bonhoeffer stood against the powers of the Nazi regime. Instead of staying in the safety of the United States, he returned to be in solidarity with those persecuted in Europe. Due to the controversial nature of his messages, Bonhoeffer was imprisoned in 1943 and executed in 1945. Threats against the life of Martin Luther King, Jr. were nothing new during his mid-twentieth century ministry. Yet even in the face of danger, abiding in the shadow-filled valleys, sitting in jail cells, walking in marches, Dr. King never was intimidated to cease his work. His life was cut short at the age of 39 by a sniper in Memphis. As Jesus said in Matthew 10 “Those who find their life will lose it, and those who lose their life for my sake will find it.” I believe that those who place themselves, their reputations, and their well-beings at risk experience the presence of God in deeper ways than most of us ever will. At no point of our ministry are we completely free from hazards, even if we hide under beds, change our names, and move to other cities. We can only stay safe for so long. Not only is ministry unsafe physically, but our hearts and souls are in harm’s way as we place our most vulnerable selves on the line. We love extravagantly, and when our parishioner walks away from the church, we blame ourselves. When someone walks out of a sermon we’ve preached on a difficult subject, we question following the call of God. We wonder what we could have done differently if a congregant commits suicide or a crime. When we open our hearts fully to ministry, we will undoubtedly be hurt time and again when our loved congregants die and we no longer see their bright faces Sunday after Sunday. We will lose a piece of our lives every time our bodies, minds, hearts, and souls are threatened, but then we will gain something greater in return. Maybe we will see a glimpse of God’s presence as fear dissipates around us. As Pastor Mary Rhodes, one of the women receiving a threatening letter said “Nothing is going to stop me from doing what God has called me to do.” With faith and determination, these pastors continue in the valleys of the shadows of death knowing that God has prepared a table in the presence of their enemies. For more information and to check out the fantastic writings of other clergy women writers, go to RevGalBlogPals.org. Confession: As a young adult living in the St. Louis area around 1992, I nixed the idea of changing the name of the fair held during the fourth of July weekend. Growing up, the festival now called Fair St. Louis was always known as the VP Fair. Why change the name, I wondered. IT’S TRADITION! I cared more about what we’ve always done and less about any symbolism and meaning behind the name VP Fair. As time passed, I learned more about the Veiled Prophet Fair and all festivities connected to the twisted tradition. During their yearly Veiled Prophet Ball, young adult women from prominent families “come out” to society, with the queen nestled next to a veiled prominent older (almost exclusively white) man from the St. Louis area. When reading about the history of the Ball, one can see the Confederate roots associated with the pomp and pageantry. In 2014, The Atlantic wrote an excellent piece on the traditions connected to the Veiled Prophet organization, adding to my education of a deeply rooted classist and racist traditions. Searching more on the organization, I stumbled upon their website. The Veiled Prophet organization stresses the philanthropic and service work done in their name. And while, undoubtedly, the organization has done wonderful things for the St. Louis area, the organization is haunted by racist symbolism in every corner – from the parade to the highly exclusive ball. Whether it was our yearly online reminder of these annual St. Louis festivities, stories of removal of the Confederate flag, or dialogues, marches, and votes on the names of the Cleveland baseball team and District of Columbia football team that we had at UCC General Synod this week, we are examining the potential sins of symbols. Each of these traditional icons have a history in oppression. While those who honor the symbols today do not necessarily support or promote a culture of bigotry, implicitly, we are all responsible for the pain they are causing minority groups. Each of the symbols I’ve mentioned continue to hold up an empire where some people are valued over others. The icons say that our history was fine just as it was, never mind that some people were considered less than made in God’s image. This is more than just being “politically correct.” (I find it interesting how people of privilege always fall back on the hardship of political correctness – as if taking away a beloved symbol is worse than taking away one’s life, physical and economic freedoms, and dignity.) With black churches burning, black Christians being shot in their sanctuaries, and black women preachers physically being threatened, it’s time for us to all gather together to make sure all people have their dignity intact – whether they are a racial minority, ethnic minority – including our Native Americans, woman or other gender minority, LGBT person, religious minority, or person with a disability. It’s time for all of us to examine each symbol to make sure that the icon isn’t robbing someone of their worth. It’s time for us to prioritize people over shallow and destructive emblems, and it’s time for us to seek reconciliation for our narrow-mindedness rooted in tradition.